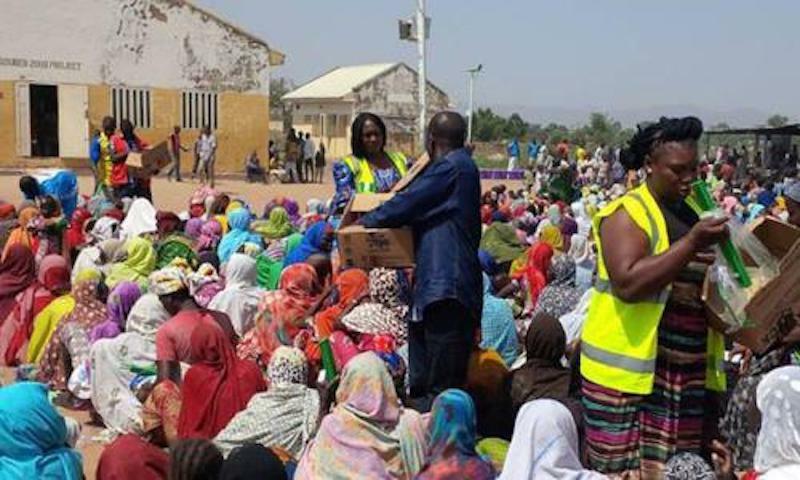 The victims of fire outbreaks at the internally displaced persons (IDPs) camps in Borno State have been given relief materials. About 230 households were last week affected by fire outbreaks in IDP camps accommodating people of both Ngetra and Zowo areas of Gubio and Marte Local Government Areas. Recent fire outbreaks in IDP camps in four local governments areas of Borno State — Nganzai, Marte, Monguno and Gubio — have left no fewer than 13 persons dead. Flagging off the distribution of the relief items at Borno State Emergency Management Agency (SEMA) stores in Maiduguri on Saturday, Governor Kashim Shettima sympathised with victims of the inferno, and pledged his administration’s determination to assist in whatever capacity to cushion the immediate hardship of the less privileged in the society. The governor, who was represented by the Chairperson of SEMA, Hajiya Yabawa Kolo, said the state government in collaboration with the National Emergency Management Agency (NEMA) and Presidential Committee on North East Initiatives (PCNI) have provided enough relief items for the victims of disaster, particularly IDPs who are taking refuge at designated resettlement camps across the state. The governor’s representative said: “We are gathered here to witness the official launching/handing over of relief items to the Caretaker Chairmen of Gubio and Marte, Hon. Zanna Modu and Hon. Ali Shettima, with a committee set up for onward distribution to victims of fire incidence that consumed hundreds of households. “Just yesterday (Friday), we were in Gajiram the council headquarters of Nganzai with Governor Kashim Shettima to launch the distribution of relief items to about 1,500 households affected by fire outbreak. “From the records at our disposal, there are four local government areas affected by fire incidence in the last two weeks. We have intervened in Nganzai, Monguno, and today we are giving out our widow’s mite to Gubio and Marte fire victims. “As you can see, Gubio, which has recorded 230 households affected by the inferno, will receive 500 bags of 25kg maize grid, 200 bags of 10kg wheat, 200 wheat flour mill, 300 sets of wrappers and 500 plastic cups. “Other items include 50 water jerrican, 50 water bowl, vegetable oil, 250 packets of sugar cube, 300 pieces of Dignitry kits, mosquito nets, 300 pieces of blankets, 300 sets of slippers and plastic mats among others for onward distribution. Receiving the items, the Caretaker Chairmen of Gubio and Marte, Hon. Zanna Modu and Hon. Ali Shettima, thanked the state government and other donors for coming to the aid of those affected by fire disaster. Modu said in Gubio alone, about 230 households of Ngetra and Zawo wards were affected with the loss of three lives, adding that the council under his administration quickly intervened by visiting the scene. Zannah, who commended Governor Shettima, SEMA and other donor agencies for their prompt response, promised that the items would be distributed within 48 hours. He said already he has inaugurated a high powered committee led by its Chairman, Alhaji Dogo Mohammed, who doubles as Chairman of the ruling All Progressives Congress (APC) with 14 other members charged with the responsibility of distributing the items judiciously. The caretaker chairman also said the committee would be given adequate cover by security agencies and men of the Civilian Joint Task Force to ensure a smooth exercise.